Taking on a role in a high-profile project with a built-in fan base is tough work for any actor. For Daniel Rashid it was even tougher: taking on the role of a legacy character whom Stargate fans had known and loved for years. 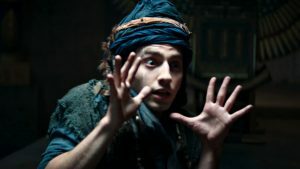 What he helped to create in Stargate Origins is a younger, more naive, and more positive version of Kasuf, who will one day become the leader of the people of Abydos. And one of the sub-plots for the digital Web series is to tell his origin story, too. Watch out for SPOILERS in this interview! 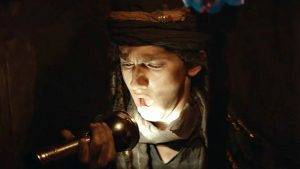 We talk about Daniel’s casting, learning to speak a variation on the ancient Egyptian language, and Kasuf’s journey — all the way to the final act. GateWorld’s audio interview with Daniel runs about 30 minutes, and is also available in a video format through our YouTube channel. Or you can read the full transcript below! GateWorld: Hello, and welcome! 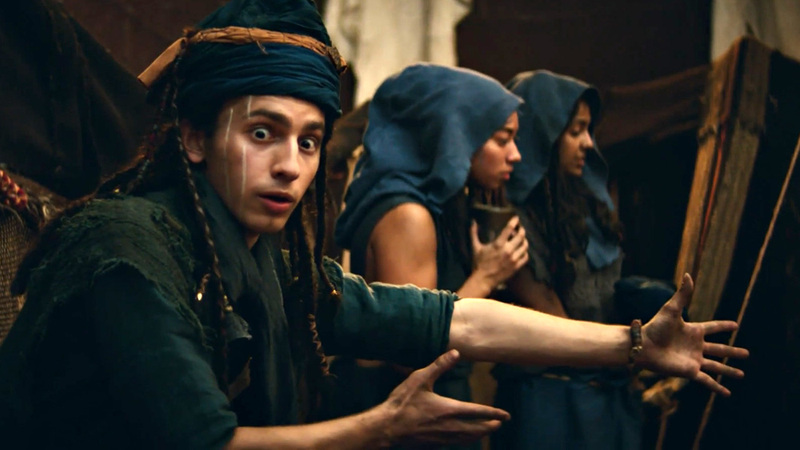 My name is Adam Barnard and on behalf of GateWorld.net I’m here with actor Daniel Rashid, who plays Kasuf in Stargate Origins. Daniel, thank you for joining us this morning. Daniel Rashid: Hello, hello! Thank you, thank you. You got the name. The name was pretty good. GW: Cool — I tried! I tried my best. DR: You got some of the “Chh-a.” It was passable. It was passable. 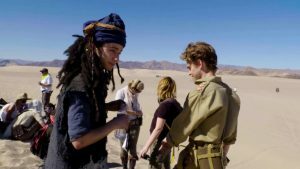 Daniel with the cast and crew on location, filming Stargate Origins near Baker, California. GW: We’ll just jump right in. You are playing a legacy character. And I’ll just go back to the normal name now — “Kasuf,” the very basic, American pronunciation. 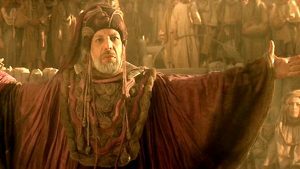 So why don’t you just talk a little bit about getting cast in Stargate — at what point you found out you were playing this character that was in the original Stargate movie, played by Erick Avari. How did that affect your process and training? DR: Sure. I got a self-tape audition, which is becoming more and more common these days for actors. The casting directors will ask you to self-tape your audition like using a phone or camera and send it into them, and then they’ll decide if they want to see you in an in-person audition. And I got a self-tape audition for a project under a code name. GW: No, we’re not monogamous. We can be both! DR: Phew! Man, what a relief. So I wasn’t familiar with the series and I didn’t piece it together that the name Kasuf was from that series. The name of the project was “Goldie.” And it was the weirdest self-tape I’ve ever received. They wanted me to improvise a short one- or two- minute scene of me teaching a made-up language to someone off-screen. I actually pulled up the audition breakdown in an old e-mail because I thought it would be interesting to read: “The director would like your client to improv a scene where he’s trying to teach us a made-up language. He thinks it’s hilarious we can’t understand something so simple.” And then they included something like this as a reference (switching the roles of English and native) — they included a link to scene from the animated version of Tarzan where Tarzan and Jane first meet and she teaches him a little bit of English, and he’s struggling through it. But they wanted to flip that, so you’re teaching a made-up language. And because he didn’t know what I was saying and didn’t know what the heck I was doing it worked really well because he was struggling to keep up with me. And it was really fun. So we did one take of it and then I was like, “Well that was fun! Let’s send that off.” And we just sent it off and didn’t think twice about it. You know usually for self-tapes you’ll do like multiple takes. But I was like, “You know what? That was fun. I have no idea what they’re looking for. Screw it.” And then two, three weeks went by it seems — 20 days went by. And I didn’t hear anything about it. Daniel’s audition for Origins consisted of putting himself on tape trying to introduce himself in an unfamiliar language — a scene he got to repeat on set with co-star Ellie Gall. And then they came back the next day and were like, “I think we can go straight to offer on this.” So then I just booked the role. And it helped — which I realized later on — that the director of Stargate Origins, Mercedes Bryce Morgan, went to U.S.C. where I went and we worked one day on a little Web series together. And so we happened to know each other. But I didn’t know that she was on board for this project because we hadn’t kept up very much since we graduated. So it’s funny how those things come back around. So I think because she knew me and knew my work they felt comfortable just booking me right away. GW: It’s good to see a familiar face pop up in casting. You usually have higher chance if you have that network already built in. GW: In your experience does it usually take that long to hear back from someone for a callback or offer or rejection? Or is it way shorter than 20 days? DR: It varies. But my experience is it’s a lot shorter. Usually you audition — like I shot a film this past summer and the process was I auditioned on Monday, I had a callback on Tuesday, I had a chemistry read on Friday, and I booked it that following Monday and I was flying out the next Monday. It was like it was like boom! So there are experience like that. There are experiences even faster. Like I shot a little co-star on grownish this past season, and I auditioned at like 6:00 p.m. on a Tuesday and I was on set at 9:00 a.m. on Wednesday. It was fast. GW: Wow! Regarding Origins … so, you got the role. 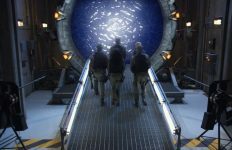 What were rehearsals like and at what point did you start to work with Stuart Smith, the linguist — who Stargate Command actually wrote an article about that process. Go ahead and tell us how that process evolved. Kasuf isn’t sure what to make of Catherine, Beal, and Wasif when he first encounters them. 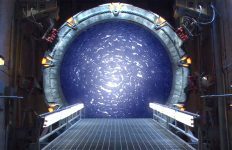 DR: So once I booked the role I found out that this is Stargate. And I was like, “Oh, woah!” And then I found out that I was the young version of Kasuf and I was like, “Oh, woah — I have to do this justice.” Like you said, this is a legacy character and there’s a certain amount of pressure that is involved with that. The danger of that is it paralyzing you as an actor and having you want to make sure that you do it right. 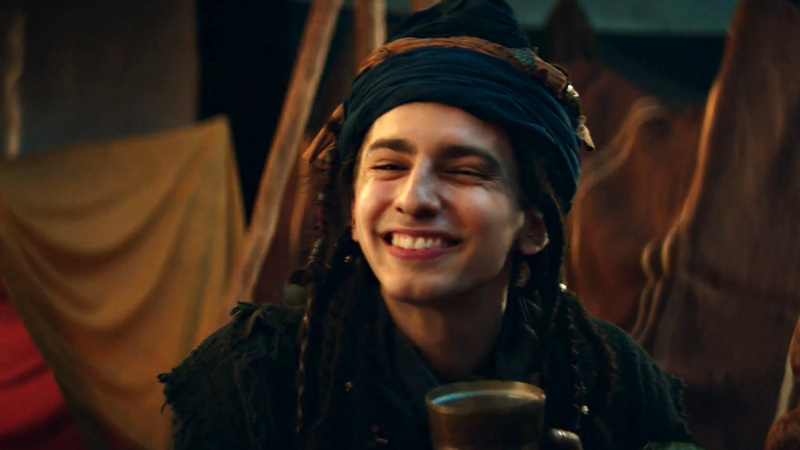 And [to] do a perfect impression of Erick Avari … that’s never going to happen. 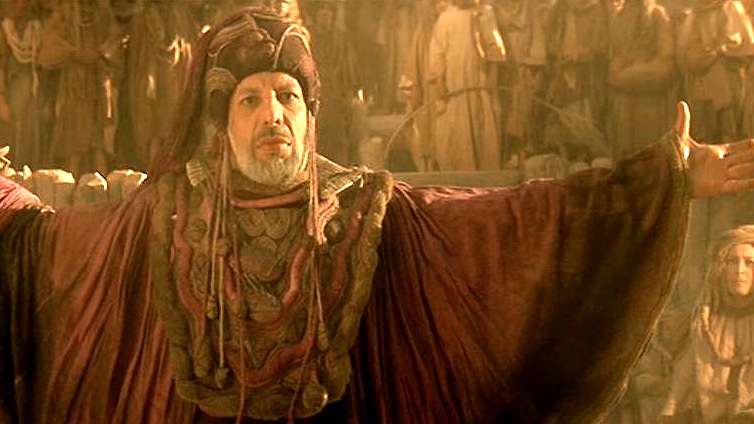 He is Erick Avari and I’m never going to be able to do an impersonation of him. But it was important for me to watch his work, but only after I did my own work on the script. So I wanted to make sure that I didn’t watch any of the Stargate stuff until after I read the scripts. I read the script and did my own personal work on the role, preparing for that. And then I was like, “OK, let me dive into the movie, to the few episodes SG-1 that he’s in, just to see what this life is like.” It’s kind of a clue into what my future is. DR: If you think about it that way. It’s like we’re the same person but at much different parts in our lives. I received a great compliment from someone on Twitter recently who said, “I could tell you’re Kasuf right from the moment you walked on. 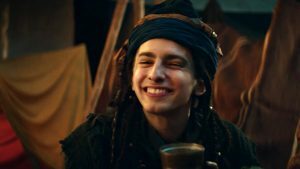 You have Erick Avari’s mannerisms down perfectly!” And that was a really wonderful compliment, because (a) I love that that’s what people are seeing, and (b) that wasn’t necessarily something that I worked on that much. But I’m glad that it came across, because you know as an actor you have the script and you have the director. You’ve got to be able to trust those. You’ve got to trust the script and trust the director. After he was cast Daniel discovered he would be playing a much younger version of Kasuf, the role originated by Erick Avari in 1994’s Stargate. 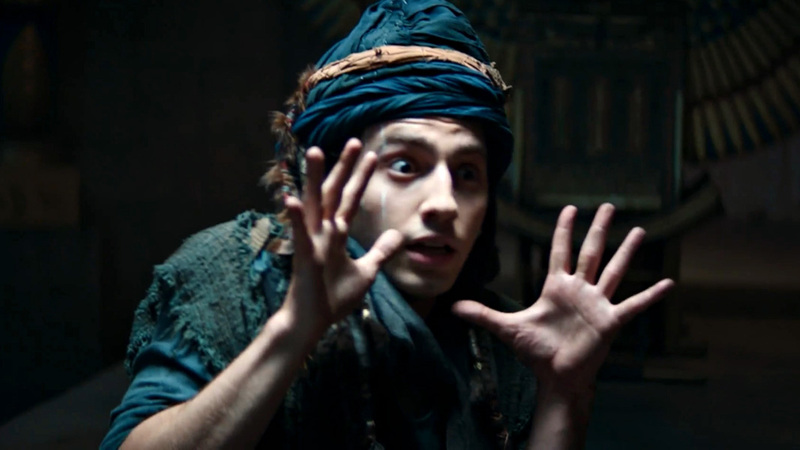 So that was kind of the big thing that I took from watching Erick Avari’s performances. And that’s honestly bigger than any kind of gesture or impersonation because that’s a heart-level kind of a thing. You know I’m saying? And that will translate and affect your gestures and your mannerisms and everything without you even knowing it. And then also I think a big part was working with Stuart and working on the language, because that’s a huge part of the character, of these people in this world. And Stuart is just the man. He is so awesome. I’m so glad that we were able to get him for this project. I would have been lost without him, seriously. GW: Can you tell us a little bit more about Stuart and his background and what his qualifications are for this? GW: … the original movie mythology. Daniel’s version of Kasuf is more innocent and enthusiastic than the character would be more than five decades later. DR: Exactly, yeah. So there wasn’t quite as much work for him to do later on there. But he’s done a lot of television and film work. And it’s really cool. You know the language is — I would definitely recommend reading the article with him. Because the language is brilliantly reconstructed and it’s something that nobody knows what this language actually sounded like. But this is what we think is a pretty accurate reconstruction of it, because the ancient hieroglyphs — just if you want to nerd out with me real quick — the ancient hieroglyphs are all consonants. There are no vowels in there. So you don’t know what those words sound like. If you live in that time you would just know based on the consonants. The earliest language that is still spoken today is in that region is Coptic. But the vowel sounds are all different. One of Stewart’s favorite stories about the original movie is that — so the god “Ra” is a very anglicized pronunciation of what they originally would have called the god. In Coptic, I believe it’s pronounced “Ree-uh.” So R-e-e-u-h. If you think about it phonetically like “Ree-uh.” But in ancient Egyptian that “uh” becomes an “ooh” sound. So it’s “Ree-ooh.” And so when Daniel Jackson and the crew first come into the village — you know, Kasuf’s village back in the original movie — and they point up to the eye of Ra and Daniel Jackson or someone says, “The Eye of Ra” — and then someone in the village says, “Ree-ooh!” They can see that the film works because they wouldn’t have known that “Ree-ooh” was how they pronounced it back in this time. And so they didn’t even understand what that villager said. GW: So the complexities of learning this — you have to pay attention, right? You can’t zone out at any point during the day! DR: Yeah! I wanted to do the role justice, and I wanted to do the language justice. And we basically had two days with Stuart before we started shooting, which is crazy to think about. We only had two days! We had two days of rehearsal. And in those rehearsals if you were not rehearsing with Mercedes, the director, you would go with Stuart and you’d sit and you do the script with him. Kasuf investigates the strange light device from Earth. From Stargate Origins Episode 9. And the way that the script was written, everything was written just in English. And then if it was in bold that means it would be spoken in ancient Egyptian. But when I got the script I didn’t have the ancient Egyptian there; I just had the bolded English. So I sat with Stuart and what he did was he basically wrote out a phonetic translation of all the bolded words that basically — it was just sounds. It’s phonetics. So it’s just the sounds of the language. And I started working on the sounds and working on the rhythms of that, just to kind of get that in my mouth and in my body. But then I quickly realized: I can’t just work on these sounds and try to memorize these sounds. I don’t really know what I’m saying. I know what the subtitle will be. But the subtitles are sometimes very clean versions of what the sentence actually is. Instead of saying, “Come with me to this forest” the sentence might be, “Forest we go there.” Something like that. That’s not an actual example, but to give you an example of how a sentence might be changed in the expression of it. So we sat together for the rest of that day and the second day and went phonetic word (Egyptian word) by phonetic word and translated them. And then I had something to say. Then I knew what each phrase was, what each word meant, and how I was expressing that. And that was the biggest clue into the language for me. And that kind of opened the door for me. And then it became really easy to learn the language, because it was actually a language I was communicating through — not just sounds that I was saying to fulfill a script. Kasuf looks for approval as he introduces the offworlders to the story of Aset’s resurrection. GW: Certainly, yeah. That’s great. You kind of want to glean the heart of what’s on the page so that you can make it come alive in the appropriate way that fits this story. It’s interesting — I’ve read some stuff recently about actors and whether they like to read the backstory. Like I know in The Shape of Water, which won Best Picture this year, Guillermo del Toro wrote these really elaborate backstories for one of the characters and a couple of people engaged but others didn’t read it because they say it’s what’s on the page that matters. It’s what this moment in the film is about. If that’s done well I don’t need to know what my character was doing 20 years ago. I need to know what he’s doing now and what he’s feeling now. So it’s interesting that you say that, because I see it kind of fitting in to that — those two different methods. And there is really no “right” way. I’m sure you know that with acting! DR: Exactly. Yeah, there’s no right way. Everyone had their own process of going about it. And there were some actors on Origins who didn’t want to learn; they just wanted to memorize the sounds. And for them it worked, and it sounded great. And it was like, “Wow, that’s fantastic that that works for you.” Because that would be a lot easier for me if I could do that!